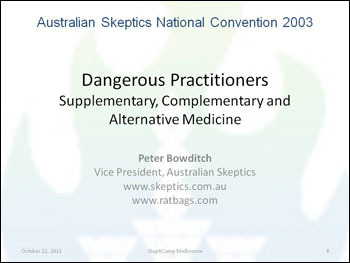 This is a modified version of a presentation I gave as part of a forum on alternative medicine, held in conjunction with the Australian Skeptics 2003 National Convention. Let's now look at what the alternative medicine industry has to say about safety, quality and effectiveness. The quotes below were made by officials of the Complementary Healthcare Council, a body which represents the participants in the industry. Now let's get on to why alternative medicine practitioners are dangerous. The first reason is that there is no need or even desire to prove that anything works. Anecdote is good enough. If someone says that something worked once somewhere then that is good enough to justify selling the stuff to anyone. There is also no guarantee of quality. As the Pan Pharmaceuticals fiasco showed, comments from the alternative medicine industry indicated no concern about the shoddy manufacturing practices at Pan but instead treated the affair as an attack on alternative medicine. The attitude of the industry towards any attempt at regulation of packaging or advertising claims shows that deceit is acceptable, as does the continual quoting of long-refuted lies such as the number of "needless deaths" in hospitals. It seems impossible to find an example of a case where anyone from within the alternative medicine industry has ever supported government action against really outrageous quackery, and in fact there is a total rejection of any form of regulation or even investigation. The reaction to the NSW Dwyer committee is a good example of this, where the committee was established to root out rubbish like cancer quackery. The response from the industry was never "I can prove that this works" but instead consisted almost totally of ad hominem attacks on the members of the committee. The Therapeutic Goods Administration oversees the manufacture, sale and distribution of medical products and things claiming to have therapeutic or pharmacological properties. There are two levels of approval - "registration", which requires evidence of safety, quality, and efficacy, and "listing", which only requires quality and safety. Both are required to have truthful labelling. Just for reference, I will quote what the TGA says. You will see that most complementary medicines can be sold without any proof that they work. To summarise, the dangers of unregulated alternative medicine are to your health, from untested medications, to your life, from avoiding proper treatment, to your wealth, from fraud and theft, to your family, from losing you, to your children, from increased risk of disease through the opposition to vaccination, and to society, by returning to the dark ages and belief in magic. To finish up, I will return to the question "Why?" again, but this time I want to turn it inwards to explain why I am concerned about quackery. Last weekend I spent time in the Museum of Melbourne participating in the Great Australian Science Show. 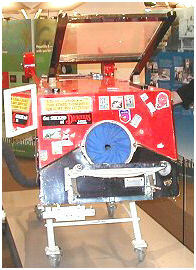 While I was in the museum I had my photograph taken standing next to an iron lung. I do not want to live in a world where such things are ever required, and I don't want my children, or anyone else's children, to live in an age where medicine is nothing but superstition and its practitioners are sorcerers.